Since two earthquakes destroyed the cathedral and much of central Christchurch in September 2010 and February 2011, the city is slowly recovering. Jenifer Roberts recalls the city’s first settlers. 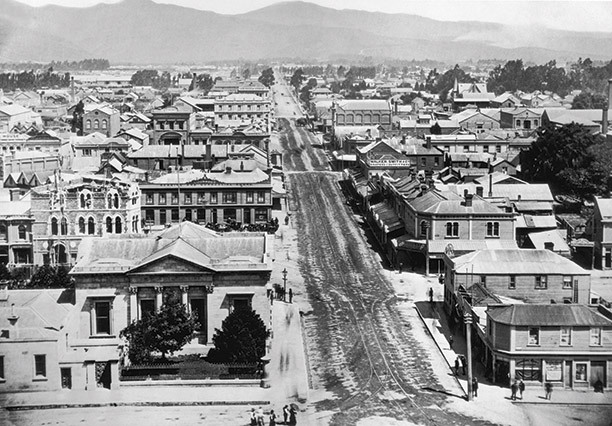 The construction of Christchurch began with the erection of a few wooden houses and grew over the decades into the most English of ex-colonial cities. By the time of the earthquake of February 22nd, 2011 it was the largest city in the South Island of New Zealand, with a population of around 377,000. Christchurch began in 1848 as a gleam in the eyes of two men: Edward Gibbon Wakefield (who had formed the New Zealand Company, giving birth to settlements at Wellington, Nelson and New Plymouth) and John Robert Godley (who had acted as poor law commissioner for County Leitrim during the early years of the Irish potato famine). Together they formed the Canterbury Association, with the aim of establishing a Church of England settlement in the South Island of New Zealand. The scheme, intended to relieve unemployment and poverty in England, attracted a number of heavyweight supporters: bishops and archbishops, Members of Parliament, aristocrats and landed gentry.